"This is my 'Geese Swim around your mug' mug. I customized with the addition of my name, which I placed so that it faces outwards when I take a sip of coffee, but otherwise left as is. This is the 11 oz. ringer mug with black trim. I previously purchased the 15 oz size, but that one broke when it fell 3 feet onto a short haired office carpet. 11 oz holds a decent sized amount of coffee. The design consists of an image of a family of geese repeated 4 times lined up near the bottom of the mug. Easy to do with the copy/paste and alignment capabilities of the product editor. 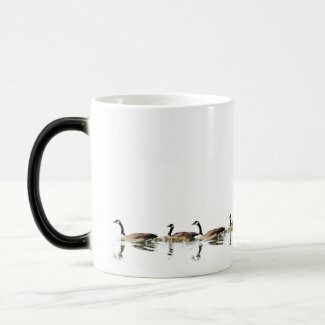 The geese image has a transparent background, so it'll blend into any color chosen as the background for the mug, although anything but white will produce a contrast with the non-designable areas. This would be a great choice for a morphing mug. Just customize and move the geese as a group to the desired refill level. When the geese disappear, get more coffee! The mug has weathered repeated hand washings and seems to be OK. The color reproduction is good, but note that the background color of the ringer mug is off-white, not white as seen in the product editor. This mutes much of the dramatic contrast of the original geese cutout (check the large version of the design view to see the difference). Also, when you shrink down the image that far there is some loss of sharpness and detail. The other design element, the copyright message prints thicker than it displays.